If you can’t get to the beach, have the beach brought to you. That’s just what happened last week for Judy, a client from the BrightStar Care of South Central, Wisconsin office. Wisconsin’s weather had been unbearably hot, and Judy told her Caregiver Amy that she missed the beaches of her native Florida. Together, the two hatched a plan. Amy searched all over the region for sand and shallow boot trays (she finally found them at an Ace Hardware store a few towns over). Judy gathered up her seashell collection. 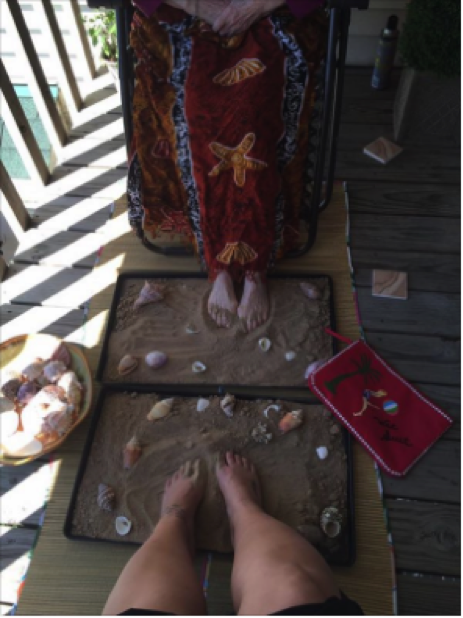 They poured the sand in the trays and arranged them with the shells out on the porch. Together, they sat with their toes in the sand, enjoying a beach day right in the middle of the Dairy State. Amy and Judy’s relationship is not an anomaly among BrightStar Care in-home caregivers and their clients. One Home Health Aide recently took his hospice patient to a Cubs vs. Brewers game. Another coordinated pet therapy with his quadriplegic patient, who had been without his two beloved dogs for 18 years. These are the kinds of connections we try to foster. Our mission is to provide compassionate, personalized home care. How do we achieve this? It all begins in our hiring decisions. “Compassion and empathy can’t be taught,” explains Pam Hatfield, the Branch Manager where Amy works. “So from the get-go in our recruiting process, we screen for these traits. In an initial phone call with a candidate, we ask questions to gauge listening skills and level of attunement.” Candidates that don’t exemplify these behaviors don’t get hired. But perhaps most integral to the sort of connections you can expect from BrightStar Care is the fact that our Caregivers meet their clients in the comfort and privacy of their homes. This close, long-term interaction promotes deep, personal relationships. “Over time, Caregivers get to know their clients and what makes them who they are, so they can deliver compassionate care, just like Amy did,” says Pam. Indeed, Amy has built a strong bond with Judy—so much so that when she was offered a job at a higher hourly wage, she decided to turn it down. “It was at a nursing home,” she says. “I’ve done that before. I don’t believe those people get the care they deserve because it’s so busy.” Amy says the busy environment also keeps caregivers from creating meaningful connections with clients, which is a part of why she first came to work at BrightStar Care—and why she’s decided not to leave.